April 18, 2019 | What’s new and happening in nearby Toronto? 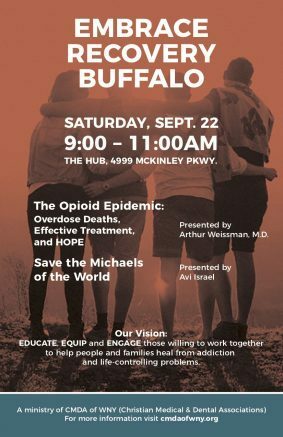 Embrace Recovery Buffalo, a new nonprofit organization dedicated to educating, equipping and engaging those willing to work together to help people and families heal from addiction and life-controlling problems, will host “Understanding Addiction and Recovery” from 9 to 11 a.m. Saturday, Sept. 22, at The HUB, 4999 McKinley Parkway, Hamburg. Presenters at the seminar will include Arthur Weissman, M.D., on “Opioid Epidemic: Overdose Deaths, Effective Treatment and Hope,” and Avi Israel of “Save the Michaels of the World.” Resources from local providers will also be available to help those addicted and/or their family members. The mission of Embrace Recovery Buffalo is to help those struggling with addiction or life-controlling problems find compassion, hope, healing and lifelong recovery through a collaborative effort that includes a biblical, faith-based approach. Under the umbrella of the Christian Medical and Dental Associations (CMDA), Embrace Recovery Buffalo is led by co-directors Darren Caparaso, M.D., and Monica Farrar, LMHC, CASAC, CRC. “Our nation and region is in the midst of the worst opioid epidemic that we have ever experienced,” said Dr. Caparaso. “The White House calls it ‘the epidemic next door.’ The new United State Surgeon General, Dr. Jerome Adams, stated in April, ‘We have a person dying every 12.5 minutes from an opioid overdose.’ The U.S. Commission on Combating Drug Addiction and the Opioid Crisis reported to President Trump that America is enduring a death toll equal to September 11th every three weeks! For more information on Embrace Recovery Buffalo and the Sept. 22 seminar, please visit www.cmdaofwny.org. Be the first to comment on "Embrace Recovery Buffalo to offer addiction and recovery seminar"
What’s new and happening in nearby Toronto?